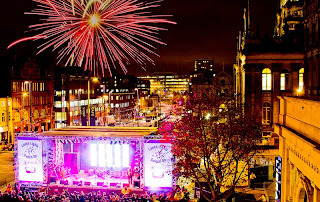 Caption: The Leeds Lights Christmas switch-on will be held on November 7. Former X Factor finalists Same Difference are the first stars to be announced for this year’s Leeds Lights switch-on. In what will be their second appearance at the event, Same Difference, which is made up of brother and sister singing duo Sean and Sarah Smith, will perform at the annual free event, which this year is celebrating its 30th birthday. This occasion will mark the beginning of an exciting few months in the city for Same Difference, who will also be starring in the Leeds Carriageworks Christmas pantomime production of ‘Sleeping Beauty’ from December. Held on Thursday November 7 from around 7pm, an estimated crowd of 15,000 are once again set to gather for the celebrations at Victoria Gardens as the city begins its countdown to Christmas. Organised by Leeds City Council and Real Radio, with support from partners the Yorkshire Evening Post, other guests confirmed to appear include up and coming boy band Rubylux, who will be joined by Australian singer Gabriella Cilmi, who had her first big hit with ‘Sweet about Me’. Also featuring will be young guitar vocalist Kirsty White - the winner of Leeds City Council’s annual Breeze Has Talent competition and of course the ever popular Santa’s Show time along with special guests. Further details on other performers and local sporting celebrities who are set to appear at the switch-on will be revealed in the run up to the night. The Leeds Light switch-on forms part of the council’s wider festive programme ‘Winter WonderLeeds’ which will provide a number of events and activities across the city centre including the 12th annual Christkindelmarkt on Millennium Square. "The Leeds Light switch-on is a fantastic way to kick off the festive season in style, and it is exciting to see some of the first guests confirmed for this year’s event, which includes former X Factor finalists Same Difference, who will be starring in this year’s panto at the Carriageworks Theatre. "Now in its 30th year this is an occasion that all the family can enjoy, and it is always brilliant to see such a brilliant crowd gather at Victoria Gardens to play their part in generating such an amazing atmosphere. Tickets are now available for the pantomime ‘Sleeping Beauty’ which runs from Friday 6 December 2013 to Saturday 11 January 2014 at the Carriageworks Theatre in Leeds. Book online at www.carriageworkstheatre.org.uk or call the box office on 0113 224 3801. The Leeds Christkindelmarkt German Christmas market will open from Friday 8 November. For more information, call Leeds City Council’s Events team on 0113 395 0891 or visitwww.leeds.gov.uk/christmasmarket. Leeds Lights Switch-On and Christkindelmarkt form part of the city’s wider festive activity programme ‘Winter WonderLeeds’ which focuses on the best in Leeds Christmas markets and events including the ‘Made in Yorkshire Festive Fayre’ Crafts Market on Victoria Gardens and a new 17 day Christmas festival on Briggate, running from Friday 6 to Sunday 22 December. In addition to the various market offerings, a Festive Family Funfair will also be taking place on Cookridge Street (between the Headrow and St Anne’s street) every Friday, Saturday and Sunday from 22 November to 15 December 2013. Open from 11am to 9pm on Fridays and Saturdays and 11am to 6pm on Sundays, the fairground and will feature the popular dodgems, flying chairs, convoy, cups and saucers rides amongst others together with a traditional candy floss and refreshment stall.